When and where fire restrictions are not in effect, wood fires are allowed in existing fire rings only and prohibited above 9,600 feet in elevation. We'll be backpacking from Ten Lakes to May Lake, which will only be above 9,600ft at certain points, so I'm excited to have some campfires when we're at the lower altitudes of our trip. However, I'm not entirely clear on what a "fire ring" will look like--google searches show me the kinds of metal things you'd have on a campground or in your backyard. What do these "fire rings" look like and--if anyone has Yosemite knowledge--how often will they be along our trail (or where can I go to find this information)? Complies with the objective rules. Part of an established, and legal dispersed campsite. Although sometimes lunch spots will have a small ring. They can be found throughout the park wherever flat spots for dispersed camping can be found, which often feels like every mile or two in Yosemite even in more remote parts of the park. However, some of these may be new and not "established", and in many cases one finds campfire rings in places that are not legal and these should be avoided. 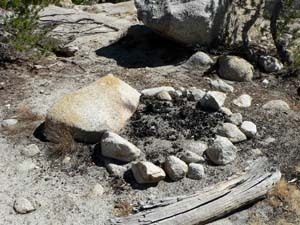 As shown in another answer, the fire rings are typically built up of rocks, but metal rings are placed in very heavily used areas and campgrounds. The rangers at the ranger station will be very explicit about fire regulations and current conditions/restrictions, it will be hard to feign ignorance. Campfire rules in most of the Sierra Nevada wilderness areas and National Parks is exactly as cited. Established fire rings that are further than 100 Yards from Water (much further than you think), and below 9600 ft (elevation varies depending on management area) are Fair Game to use. Additionally, during the summer, blanket fire bans can be imposed depending on wildfire conditions there has been a July->October fire ban in place for the last 10 years it seems. I have on one occasion been approached by a passing wilderness ranger for using a campfire ring that was not "established", in that case it was a prominent campsite and ring, but much too close to the water. They requested that we put out our fire and move further away, noting that the campsite and fire ring was slated to be dismantled and posted due to its heavy use. We complied and had no issues or fines, as long as you act in good faith I would expect the same. However, campfire during a fire ban period is bad juju and will incur the wrath of rangers. I love campfires, so do not begrudge you wanting to make a fire, but in places heavily impacted like May Lake and other parts of Yosemite, I attempt to abstain because the evidence of human impact is everywhere. I try to save it for the more remote areas, where human impact and human travel is sparse. However, Please note. Higher elevation, above the tree line in areas that are not wildfire ecosystems and with sparse trees, a single largish campfire can burn years of dead-fall that would have served as food for various bugs and critters, sustaining small birds and animals like frogs and lizards and recycling those nutrients into the soil for the delicate plants that are then eaten by other small animals like the cozy Pika. If you find yourself looking at a desolate landscape, even below the legal elevation, try to abstain from picking the few sparse twigs available for you to build a fire. May Lake is lovely. Hoffman is a great peak to bag while you're there. As I recall, the camping at May Lake is quite well developed and you should find bear boxes and legal metal fire rings there. It sounds like you have an expectation that when camping, it's nice to have a camp fire. I think a lot of people have positive associations with those things. But the impact of people and fire on the environment has reached the point where I'd encourage you to develop your no-fire ethic. I generally don't build a fire, and I've gotten to the point where I don't miss it... the soot... the smoky smell in the clothes... the worry about whether it's dead out. After just a couple no-fire trips, I think you'll find plenty of other beautiful things to enjoy besides the fire. Also, notice that May Lake camping is by reservation, so arrange that ahead of time. On the map you link, the "camp" icons show where you can expect to find developed camp grounds. They will be a ring of rocks around an area with ashes that has clearly been used for fires before. You can see examples of illegal ones here. Legal ones would look the same, just be already existing and within the location requirements. In order to minimize the impact to park ecosystems and to be fair to the experiences of other wilderness users, backcountry campers are required to camp outside of the no camping zone and more than 100 feet away from trail or water. Since wood is scarce at high elevations and important to the other living things that live there, they also cannot build fire rings above 9,600 feet in elevation. When the restoration crew finds sites that violate these requirements, they remove the site so that future campers are not encouraged to use it. As for how many and where they are, that depends on the area and I doubt there will be maps. You are basically looking for places where people have camped before, so flat areas close the trail and relatively near water are your best bets. Actually, I don't remember many fire rings at May Lake, but we always camped well above the Lake. It is the site of a High Sierra Camp, and there is thus an incentive to keep it "clean". Camping near lakes and streams is "illegal" and taken seriously at May Lake. As an aside, I don't remember any fire rings on the approach to May Lake from the May Lake Trailhead; that trail is heavily travelled by day hikers, there is no water and most of it is very exposed. You, however will not be taking that trail, and I haven't hiked from Ten Lakes to May Lake. If the trail you will be taking goes along a stream and is in woods, I'd be very surprised, based on lots of experience, if you did not find at least a few fire rings, some of them maybe too close to the stream to be "legal". But as long as you follow the rules about peeing and pooping and discarding wash water, and you leave no trace, you will be a good citizen even if you camp closer to the stream than, strictly speaking, you should according to the rules. The above paragraph may upset some people, but if you obey the reasons for the rules and leave no trace, that should suffice, in my opinion. One thing you mustn't do is construct your own fire ring. Even if you dismantle it and carry out the ashes, you will leave behind stained dirt, possibly killed vegetation, and fire-stained rocks. That is, you will leave a trace. You'll find them around May Lake pretty easily, but probably not on the rest of your trip. Not the answer you're looking for? Browse other questions tagged backpacking fire yosemite or ask your own question. Why use a Dakota fire pit?